Alkanes treated with chlorine gas (Cl2) and light (hv) or heat (Δ) will be converted into alkyl chlorides. The mechanism for the chlorination of methane, in common with the mechanism of most radical reactions, consists of three stages: initiation, propagation, and termination. 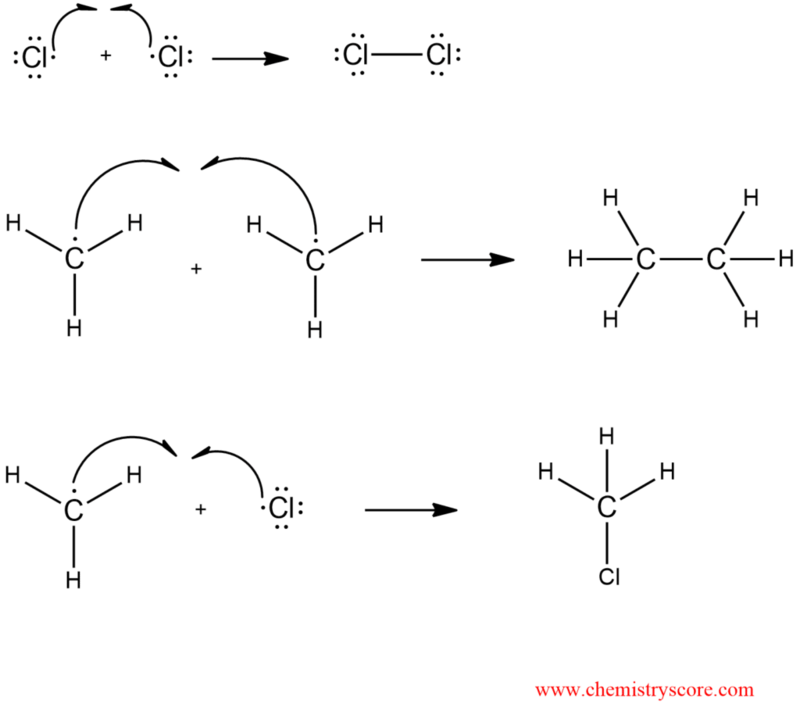 Initiation: Creation of radicals – When Cl2 is irradiated with ultraviolet radiation or sunlight it comes to homolytic cleavage of the Cl-Cl bond. A chlorine atom has an unpair electron and acts as a free radical. Hydrogen abstraction – a chlorine atom attacks methane by abstracting hydrogen atom. A hydrogen chloride (one of the products of the chlorination reaction) and a methyl radical are formed. 2. Halogen abstraction – A methyl radical abstract a chlorine atom from one of the starting Cl2 molecules. Chloromethane is formed in the second propagation step like a main product of the chlorination reaction. And new chlorine atom reacts with a new molecule of methane in propagation step 1. But this is not the end of the reaction. It continues to form di-, tri-, and tetrachloromethane by further substitution. If we want to stop the reaction at monosubstitution we must use of a large excess of methane and a small amount of Cl2 in the reaction. In that case, the reactive intermediate chlorine atom is at any given moment surrounded by many more methane molecules than product chloromethane and chance to find chloromethane is very small. And that is why the formation of dichloromethane is substantially reduced. Free radical chlorination of higher alkanes proceeds by radical chain mechanism analogous to the one observed for methane. A C-atom with at least hydrogen atoms will be substituted.